Transitions Stained Concrete is suitable of internal and external floors in the residential, commercial, industrial and retail environments. It can be commonly found in the living areas of homes, in offices, showrooms, shops and warehouses, to name only a few. 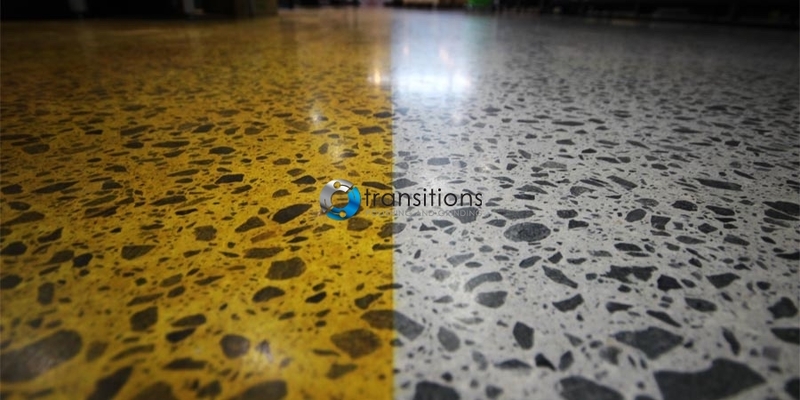 Transitions Stained Concrete is installed using a micronised translucent colour pigment, which makes it ideal for floors that have minor imperfections or for tying in two different slabs together. The stain will not affect the colour of the aggregate but rather create a consistent colour throughout. These pigments can be applied in a number of methods depending on the design outcome you are trying to achieve. The concrete stain is applied to polished concrete floors prior to the final polish. Transitions provides you with a palette of colours to choose from. Transitions Stained Concrete is a great way to give your concrete floor some character. Incorporate logos, pictures, patterns and even saw cuts, or simply add a touch of colour to liven up that grey concrete colour. This is also a simple solution to maintaining a firms corporate identity across multiple retail stores and office spaces. A clear divide between the stained concrete and polished concrete floors at Capri on Via Roma shopping centre on the Gold Coast. Stained concrete floors at Capri on Via Roma shopping centre on the Gold Coast. Stained concrete floors at First Choice Liquor store specifically coloured to match branding. A close up of the stained concrete floors and gloss levels at Capri on Via Roma shopping centre on the Gold Coast. Stained concrete floors in the food court area at Capri on Via Roma shopping centre on the Gold Coast.